Welcome! We are the Eureka Freemasons - a fraternal and charitable organization. Eureka Lodge #20 was founded in 1873 under the Grand Lodge of Free and Accepted Masons of Washington. Eureka's stated meetings are on the first Mondays of each month at 7:30 pm at the Green Lake Masonic Center, 307 N.E. Maple Leaf Pl., Seattle, WA. 98115-5315. 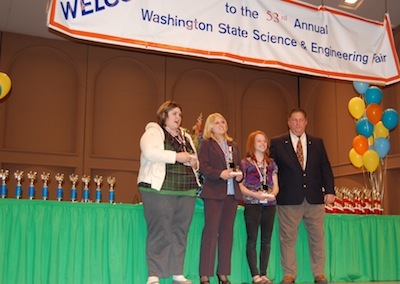 We sponsor the Washington State Science and Engineering Fair (WSSEF), which is the one and only ISEF-affiliated state science fair in Washington. Worshipful Brother Tom Eastman of Eureka Lodge #20 was the co-MC of the 2010 and 2009 Awards Ceremony. M. Iredale (center student) was the Gold Medalist for both 2010 and 2009. In 2008, Brother Gordon Guthrie of Eureka Lodge was Co-Emcee of the awards ceremony, and is shown here presenting awards to Silver Medalist E. Liu, Gold Medalist A. Cays Vesterby and Bronze Medalist E. Foss. 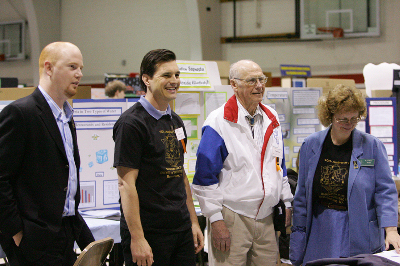 Brother Al Smith (not shown here) also attended the fair and has been instrumental in our partnership with the WSSEF. 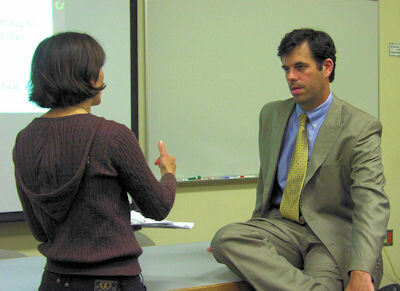 In 2007, Eureka brothers Tom Eastman Jr, Dan Williams, and Al Smith helped by judging the the entrants in the psychology category. Eureka Lodge sponsorship covered the awards budget for all students participating in the fair. 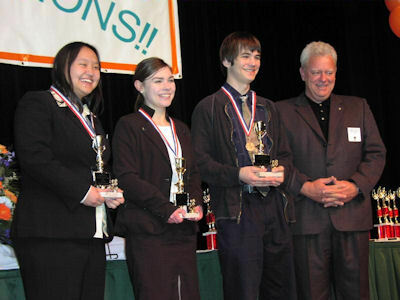 In 2009, Eureka Lodge became a major sponsor of the Seattle Public Schools Middle School Science Fair, carrying on after the ten year grant from original benefactors Reynold and Julie Atlas. 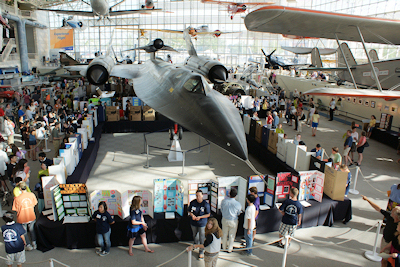 See us at this annual Science Fair held the second week of June at the Boeing Museum of Flight in Seattle. Every year over 200 middle school students participate. In 2008, we've sponsored the Center for Inquiry Science (CIS) at the Institute for Systems Biology, whose vision is to bring the experience of inquiry-based science learning to all students in Washington State. We sponsored the keynote presentation at CIS Summer Academy 2008 by Andrew W Shouse, PhD, which was attended by over 60 science teachers and administrators from school districts across Washington State. Dr Shouse discussed key research findings and classroom ideas from his co-authored book, Ready, Set, Science! A school in the Green Lake community dedicated to the sciences and youth social development. More participation is expected in 2014.